Aquasana AQ-5300 Review – Is it suitable for you? Aquasana is one of the well known water treatment companies in the market. Their main specialties are drinking water filter and whole house filtration system. There are a total of 3 similar multistage filtration system that was introduced by Aquasana. One of the flagship model is the AQ-5300 water filter. The only difference between the 3 is the maximum capacity of the water that could be produced on one replacement. The AQ-5300 is a 3 stage undersink filter which is priced at just below $150. It equips with a battery operated alarm which alert when filter replacement is required. This is a nice to have feature but is not a necessary criteria when choosing a water filter. 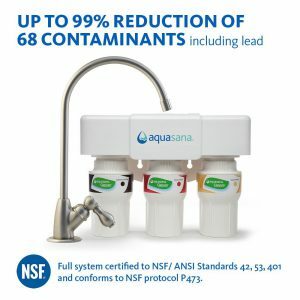 Aquasana claims that their 3 stage filter is able to remove 68 contamination and up to 97% of chlorine and chloramines. It is certified by NSF on the effectiveness of removing harmful minerals and particles. However, some major minerals such as nickel, fluoride, barium, copper were not tested by NSF. The main drawback is the short filtration lifespan which is half a year or 600 gallons of water. It is merely 3.3 gallons per day across 6 months which is barely enough for a family of 4. Comparing to the reverse osmosis system, the AQ-5300R is able to do a decent job in filtering most of the harmful minerals with only 3 filters. However, the filter performance deteriorate rather quickly as compare to others which raise questions on the effectiveness. Not suitable for well water filtration system as total dissolved solid (TDS) remains high after filtration in some water sources. Recommend to check out the APEC ROES-50 for well water filtration. Below are the summarize technical specification that you should know before buying the Aquasana AQ-5300R. The Aquasana AQ-5300R water filter comprise of 3 stages filtration system. However, it is not as fine as compared to most of the filters in town. Stage 1: 20 micron sediment filter – It’s capable of removing sand, rust, dust and other visible contamination. 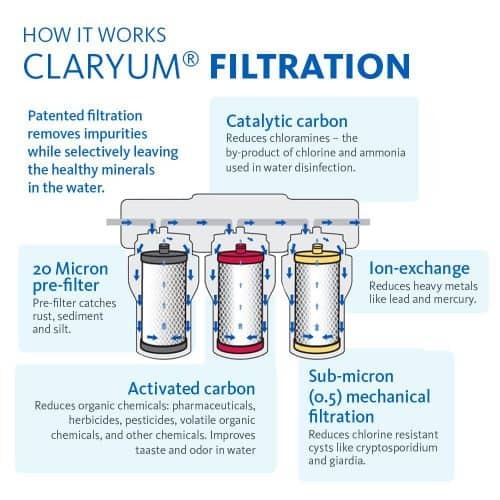 Stage 2, 3: Claryum Technology Carbon Filters – Activated and catalytic carbon is capable of reducing chloride, VOC and pesticide. Using ion exchange, it is able to reduce heavy materials such as lead and mercury. Aquasana stated that their filters are capable of removing 10X contamination compared to the leading pitcher while retaining the healthy minerals such as calsium, magnesium and potassium. Installation for Aquasana AQ-5300R water filter is very straight forward and simple. Follow the steps from the manual and online video will probably take you an hour at most to finish the installation. There are some additional tools needed if there isn’t a faucet hole on the sink. Aquasana AQ-5300R filters has a shorter than usual life spans as compare to it’s competitions. The suggested replacement is every 6 months or 600 gallons of water. The system will have a battery operated indicator which reminds owners on when replacement is needed. Owners can would not need to remember when is the next scheduled maintenance. The replacement filter is extremely expensive which costs $65 for every 6 months and $130 for a year. Fortunately, if you join their “Water For Life” auto renewal membership, you will receive a $10 discount every time you replace your filter when they send you the filter every six months. Click here to find out more. The Aquasana AQ-5300R water filter received mixed review from existing owners from Amazon. A summarize comments that was left by the existing owners for this water filter. + Easy to install and provides great tasting water. + It would have been 30 minutes but I had to cut out another hole in my granite counter top. + Filter works beautifully, no leakage after 2 months. Water tastes great!! – I just wish that it flowed faster. It takes a while to fill a single glass of water. Aquasana AQ5300 definitely is not the best choice in the market for the filtration system. Here some benefits that you might gain from this system. Small in Size: The size is no brainer. It saves you a lot of space under the counter in your cramp apartment. Lightweight: No worries on the falling off on supporting frame as the system is lightweight. No Wastewater: Unlike reverse osmosis system, it doesn’t generate waste water in the process of filtration. Click on the button to get the updated discounts and find out the reviews of this system. If you are open for other options after reading this Aquasana AQ-5300 review, why don’t you look at the iSpring RCC7 ? It is about the same price but it is much affordable on maintenance in the long run. Thanks for posting this! I’ve actually been looking for a good water filtration solution (beyond my Brita pitcher), and I didn’t know that under-the-sink filters existed. I’m definitely going to check this out. It is great to see that you have been using Brita pitcher for all these while. You will find the taste completely different from pitcher. If you have additional $40 extra, you can go for the Express Water Reverse Osmosis System. It is the cheapest reverse osmosis system in town. This is a great looking product, and I appreciate your bringing it to light. Thanks again! Yes, under sink filters can hidden in the kitchen makes it more spacious and neat.. I have been considering buying a water filter for some time. Currently I am only using water from (glass) bottles. 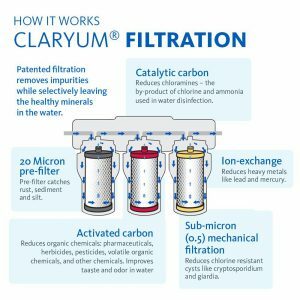 What is the main benefit besides cost of getting a water filter? I don´t think this water filter is good for me. We are a family of five and we are in need of a lot of clean water. Also the price for the filter replacements are high, even with the 10 dls discount, and if you live in a place where the water is not so clean, the filters won´t last 6 months but much less time. This review is very well done, thanks for the information. If you are looking for a more effective water filter, I would recommend Home Master TMAFC or the TMHP. Both of them are great in filtering contaminated water.